1) Stuff you won’t see anywhere else. Literally. The Mystic Seaport Museum is delivering big on its promise that the Thompson Exhibition Building would bring extraordinary experiences to visitors. The Vikings Begin: Treasures from Uppsala University, Sweden features 43 artifacts dating to the 7th Century, never before seen outside of Sweden. Similarly, The Vinland Map - which ignited a firestorm of controversy in 1965 when it raised the prospect that Vikings from Scandinavia reached North American shores as early as the year 1000 - is on view outside New Haven, CT, for the first time in more than 50 years, in the R.J. Schaefer Gallery. Science, Myth and Mystery: The Vinland Map Saga also includes a fantastic section on the findings of Helge and Anne Ingstad, husband and wife explorers and archaeologists who discovered a Norse settlement on the Newfoundland coast that dates to the year 1000. These special exhibits both close Sept. 30. Both exhibits do much to distinguish myth from reality. 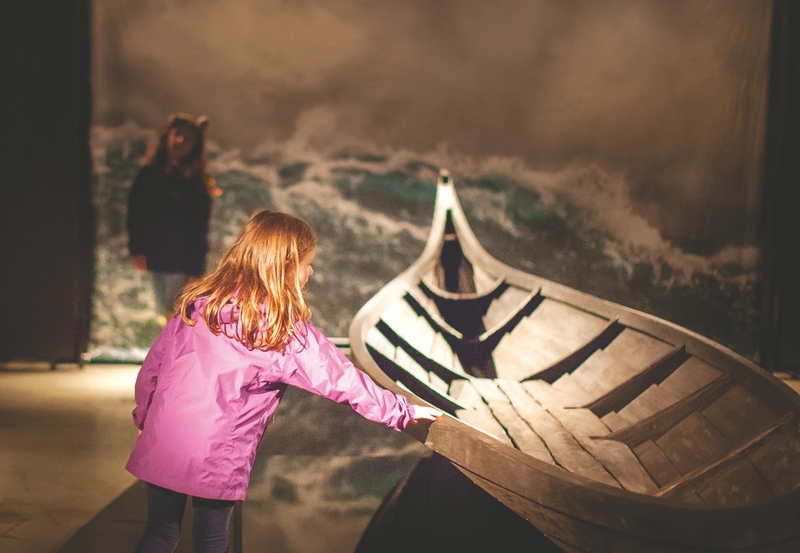 As our kids navigate modern appropriations of Norse culture, this is a great chance for them to learn the story behind their favorite stories. For example, young kids are probably familiar with Fangbone, a popular graphic novel and animated series about a third grade, time-traveling warrior sworn to protect his homeland from an evil sorcerer. He’s teamed up with Bill, a quirky modern kid. Hilarity ensues, with memorable catchphrases like “Warriors do not get scared! Warriors get … uneasy.” Or if they’re middle school age and older, they are likely reading the Magnus Chase series by Rick Riordan, who deservedly has made a gazillion dollars mining the world’s rich mythologies for young adult fiction and bringing words like Valhalla and Asgard back into common parlance. Reality doesn’t disappoint. The scope of Viking travel and trade, vibrant cosmology, and remarkably detailed weaponry will prove inspiring to adventurers of all ages. Both exhibits are included with general admission, which means opportunity to enjoy the Seaport Museum’s beautiful waterfront grounds, historic gardens and its recreated 19th century maritime village. Hands-on play and learning is the emphasis at the Discovery Barn, where families and school-age children learn how ships work and run. Visitors age 7 and younger love the Children’s Museum activities: they can swab the deck, move cargo, cook in the galley, dress in sailors’ garb and sleep in ships’ bunks, in addition to the playscapes, toy boat building, and numerous other daily activities. Bonus? If you book online, you get a 10 percent discount. And when you fall in love with the place, apply the cost of admission towards a membership to save even more. Mystic Seaport Museum is known for casting familiar topics in a new and creative light. One example is Voyaging in the Wake of the Whalers, a highly interactive exhibit which goes beyond the practice and industry of whaling and illuminates related people, places, vessels, art and culture. Some of the elements are also on display to the public for the first time. There are touch-activated information stations, videos, digital maps and games, to engage all ages. Mystic Seaport Museum is located at 75 Greenmanville Ave, Mystic, CT 06355, and is open daily from 9 a.m. to 5 p.m. Visit mysticseaport.org, call 860-572-0711 or email info@mysticseaport.org.